Created in partnership with the Minnesota Department of Corrections, A New Direction is a comprehensive, cognitive-behavioral treatment curriculum for offenders with substance use disorder. The curriculum is divided into six core modules and a Co-occurring Disorders module. Learn more about A New Direction Complete Collection. Release & Reintegration Preparation along with the Relapse Prevention Module are the last in the series when you follow the program. Offenders will learn facts about what to expect after release and how to stay in recovery and crime free. 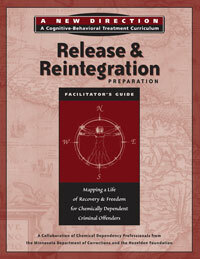 The Release & Reintegration Preparation Complete Module includes a facilitator guide, 100 participant workbooks, The Turning Point video, and Life on Life's Terms video. Topics in this module include: Criminal and Addictive Thinking, Building a Foundation for Your Future, Setting Housing Goals, Setting Employment Goals, Your Budget and Free Time, and Your Plan for Life after Release. All components are also available separately, but you can save money by purchasing the complete module! A New Direction Complete Collection: Everything you need to implement this evidence-based and proven-effective program including the six core modules, guidebooks for administrators and staff, outcome studies, forms and research studies. An additional 48 sessions that span all six modules are included in the complete collection (not all available in the individual modules), allowing you to extend your program based on the needs of the clients you serve.